You’ll probably recognise Steven Agnew from posters tied to lampposts for the 2009 European election where he returned the Green Party’s highest ever vote. He went on to contest North Down at the 2010 Westminster elections. But after his first bit of electoral success, he has been elected as the new leader of the Green Party in Northern Ireland. The leadership election was a Down contest with North Down’s Steven Agnew up against South Down’s Councillor Cadogan Enright. In recent years the local party had two co-chairs, one male and one female. In an extraordinary general meeting in the autumn, the party agreed to switch to mirror many of their affiliated European Green parties and elect a “clear and definable leader to act as both figurehead and primary spokesperson, particularly ahead of council and assembly elections”. The leader is elected for a four year term. 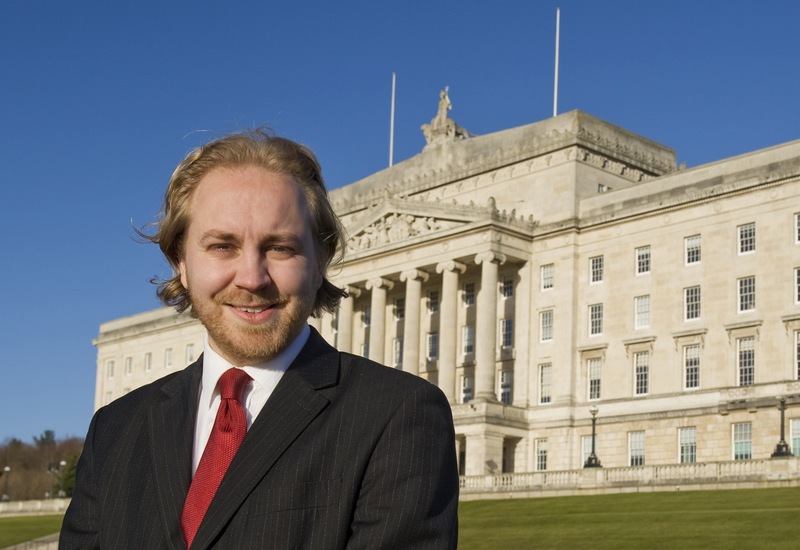 Before entering politics full time, Steven Agnew spent five years working as a Support Worker with the homeless. Until now he has been the Green Party’s spokesperson on Children and Young People and Animal Welfare as well Research Officer for the Green Party’s current North Down MLA Brian Wilson who is standing down from the Assembly (but not council) at the next election. Steven will be the party’s candidate in North Down for May’s Assembly elections. Ahead of this morning’s announcement, I posed some questions to the winning candidate. (1) What’s the Green Party’s vision for Northern Ireland? The Green Party wants to see all political decisions based on whether they are good for the economy, good for people and good for the environment. That should be the benchmark, but too often the economy is prioritised at the expense of the latter two. The economy must serve the people, not the other way around. We need economy for people and planet. This is the basis of the Green New Deal which is now beginning to find political favour at the highest level and was a key part of the recent draft budget. The fact that others are following where the Green Party has led puts to bed the myth that the Greens are a single issue party. We have shown that not only are we champions of the environment but we also have the solutions needed to create jobs and boost the economy while also improving the living conditions of the people of Northern Ireland. Although I never thought I'd see the day when my old economics teacher Sammy Wilson started stealing our policies. (2) A lot of the time, caring for the environment is perceived as being inconvenient and hurting your pocket. In these times of fiscal restraint, can you describe some of the Green Party’s policies that would help reduce public (departmental) spending and reduce members of the public’s spending too? A key principle of being Green is to reduce. Reduce waste and inefficiency therefore reduce costs. In fact that was a key role of the Sustainable Development Commission which the UK government has decided to scrap, and the NI Executive has followed suit by axing the Northern Ireland branch. The SDC saves more in efficiency savings than it costs to run. The agenda here and in London seems to be to get rid of pesky arm lengths bodies that keep ministers in check, and pass it off as spending cuts. To answer your question directly there are many Green Party policies that are cost neutral or would lead to savings for the public and/or for departments. The obvious example is scrapping Trident which would save up to £100 billion. I appreciate that that is not something we have much of a say in in Northern Ireland, however I would like to see our MPs making the point that our block grant is being slashed while this government is wasting money on an outdated Cold War defence system. It seems too much like little boys with their big toys to me. It would be ludicrously funny if it wasn't so serious. The insulation scheme proposed as part of the Green New Deal would lead to direct savings for the people of Northern Ireland. Half a million homes could be insulated over four years leading to reductions in household bills. We currently spend about £2 billion per year on imported energy so energy efficiency would mean more money being kept in the local economy (producing our own energy through renewables would boost our economy further). The scheme would directly create 5,000 jobs as while sustaining up to a further 10,000 jobs indirectly. And, of course, there would be a reduction in carbon emissions due to less need to burn fossil fuels. The plastic bag tax when introduced will bring in revenue that could be spent on investment in Green New Deal initiatives. And while it might seem at first that this is a cost to the individual there will also be savings for councils with less waste being sent to landfill, resulting in lower rates bills or improved local services. PPS 14 would have reduced the number of single dwellings in the countryside had it not been watered down by a weak Environment Minister. These single dwellings require public spending on infrastructure such as roads, waste facilities, public transport and, dare I say it, water. The public is footing the bill for a lack of sustainable planning. There are also current examples of Green policies leading to departmental savings. Fantastic work has been done by the Belfast Health Trust to increase energy efficiency and reduce water usage leading to savings in utility bills. Real cuts in spending that don't cost jobs or lead to a decline in services. The wind turbine at Antrim Area Hospital paid for itself within four years and will generate income for the trust over the rest of its lifecycle of approximately 20-25 years. Similar results are being achieved by the wind turbine that powers the recycling centre in Bangor. (3) Electorally, the Green Party in NI is obviously trying to grow sustainably from a small base. You’ve an MLA and a couple of councillors. It’s a long game, but what’s your realistic expectation of representation across the 26 local councils post May’s elections? We currently have three councillors and I would be expecting us to treble that number in May's elections. We should increase our representation on North Down and Down District councils as well as making a breakthrough in Belfast and Castlereagh. Based on our European election figures I would anticipate our vote increasing across the board so we might spring a few surprises in other areas as well. It is important that we capitalise on that growth in these elections by significantly increasing our representation. (4) How can a single councillor actually make a significant difference in a local council? If a councillor champions a cause that then gains widespread public support it is amazing how quickly other councillors will jump on the bandwagon and claim they were behind the campaign from the beginning. There was a proposal by North Down Borough Council to sell off an acre of land at Seapark, Holywood. Brian (Wilson) was actually on holiday at the time and I received an email from a concerned resident who opposed the plan. I replied offering my support and was told that Lady Sylvia Hermon and I were the only ones who had responded and that no Holywood councillors showed any interest. When Brian returned he was able to give background on the proposals that were a joint venture of UUP and Alliance councillors. After a 2,000 strong petition was handed in to the council every Holywood councillor opposed the proposal which was then scrapped. Neither I nor Brian would claim to have single-handedly saved Seapark, it was very much a victory won by the residents of Holywood. However had the residents not received the support of a Green Party councillor the campaign may have seemed futile. There’s a good hustings Q&A featuring both candidates over on Jim Jepps’ blog The Daily (Maybe) including the candidates’ views on what can be learnt from the experience of the Irish Greens. And as always, there’s more coverage over on Slugger O’Toole.